So this week I got my copy and eek! I loved what I saw. I picked up my envelope on the long ride to a furniture store in search of new bookstores – I’ve run out of shelves in my studio hence we are in search of new bookshelves to move some of my books to the living room but that’s another story so I digress. I picked up my envelope on my long ride to Tempe to a furniture store in search of new bookshelves for the living room. I opened and closed the magazine on the same page about 15 times. Opened. Looked. Ah! Closed. Opened. Looked. Eh! Closed. And repeated the endless loop as if I’d find something new the next time I opened the magazine on yet the same page. No, I was not the designated driver to our Tempe furniture “boutique.” What do you think? I’m not that reckless! So as soon as we got home I took some quick pictures and wrote this post. And I know that deadlines are pretty tight for me right now but I had to share them with you. 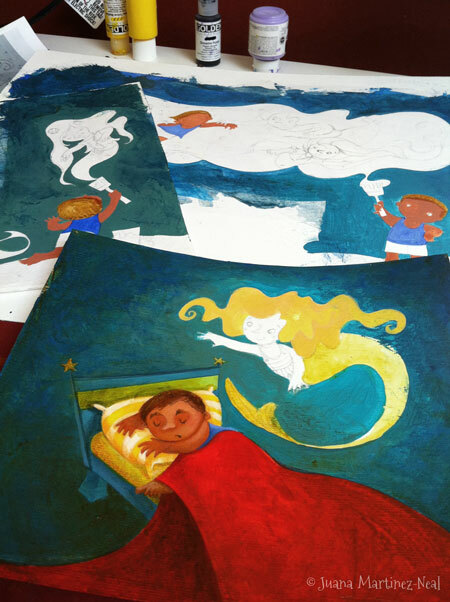 So without further ado, boys and girls, “Jorge, el Pintor de Sirenas” IN PRINT. And now with all my Peruvian pride, some process photos I took while working on the pieces last June. I love taking process pictures and I bet you know that about me by now. Christianne and Mark work really hard to bring an Spanish children’s magazine to this country and they deserve support. Show it by subscribing to “Iguana Magazine” for a year, two, three or four. You can read more about the magazine duo here. And now I leave you proudly saying: Hasta pronto! Wonderful, work, Juana! Love these illustrations, and thanks for sharing process pics! These are very beautiful Juana! Hello Alia! Nice to meet you. For these pieces I only used acrylics. I was tweaking my technique and still experimenting here. Hope this helps!